If your like me you absolutely love the Pandora music service. However due to greedy music labels pushing their agenda in Washinton (see SaveNetRadio.org) Pandora was forced to limit its service to the US. What’s a geek to do? Why… use an ssh tunnel to proxy the Pandora service through a US server. How? You may ask. First we’ll setup the ssh tunnel. For that we’re going to use an application called Putty. To setup the ssh tunnel you’ll need to have access to a server based in the US with ssh enabled (for example – a Dreamhost account). For the purpose of the tutorial we’ll call the server “example.com”. After launching Putty you need to enter the hostname into the field provided. Now comes the magic. Expand the SSH category and select Tunnels. Under source port enter 8080, select the “Dynamic” and then click the Add button. Click on the Open button. After click on Open you’ll be prompted for your username and password for, in the case of this example, example.com. After successful establishing your ssh connection all you have left to do is setup Firefox to use this ssh tunnel as a proxy. Open up Firefox and select “Options” from the Tool menu then click on “Advanced”. Next click on the “Network” tab, then the “Settings” button. Select “Manual proxy configuration”. Now comes the important settings. Erase the HTTP Proxy, SSL Proxy, FTP Proxy, and Gopher Proxy fields. 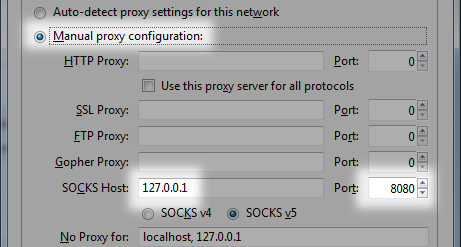 Enter 127.0.0.1 under SOCKS Host and 8080 under Port. Click OK and click OK once more. We’re done! Browse to www.pandora.com and crank the tunes.